St. Francis Trail | Florida Hikes! It’s hard to believe, as you walk under bowers of live oaks and cabbage palms, that a town once crowded the wharf where the St. Johns River turns away from the St. Francis Dead River, where growers loaded boatloads of citrus, watermelon, and cabbages onto steamships for markets up north. Bustling in the late 1800s, the community’s death knell was a triple whammy of freezing weather, hurricane-related flooding, and the wane of the steamboat era as the railroads pushed south on the river’s opposite shore. 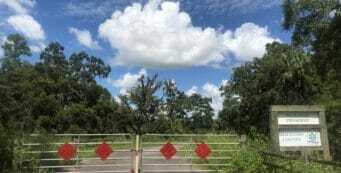 By the 1940s, the last resident left, and the federal government bought up the land for the Ocala National Forest. Bounded on the north by the Alexander Springs Wilderness and on the east by the mighty floodplains of the St. Johns, the St. Francis Trail is a very enjoyable hike. Be cautious hiking here during general gun hunting season, usually Thanksgiving-New Years, as it’s a popular destination for hunters. Be sure to wear a blaze orange vest if you do. Backpacking / primitive camping is not allowed during that period. From Deland, drive north on SR 15 or US 17 to intersect with SR 44. Head west on SR 44 (New York Avenue) for 4.2 miles from SR 15, crossing the Whitehair Bridge over the St. Johns River. Turn right onto SR 42 at the light after the bridge. Watch for the sign on the right – it comes up fast. Turn right at River Forest and drive past the group camp to the trailhead at the end of this short unpaved road. 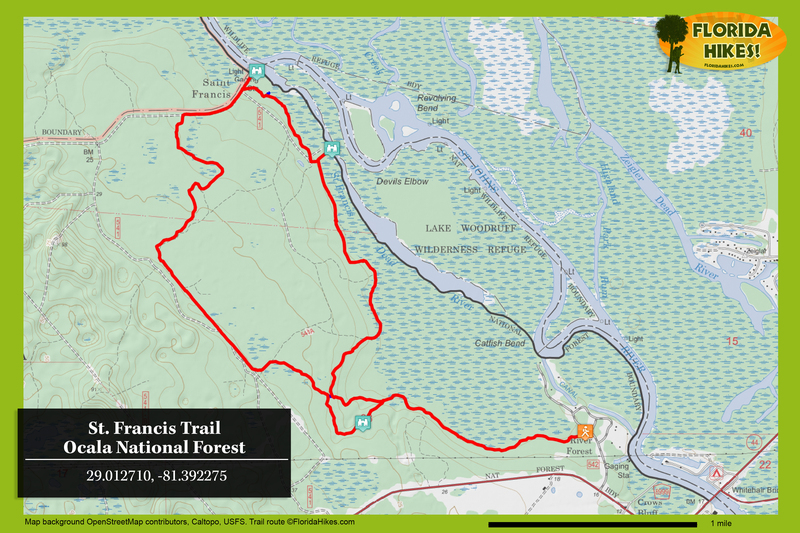 Starting from the trailhead kiosk – which is where you’ll learn about St. Francis’ agricultural past – follow the orange blazes (painted over the former blue blazes) into an upland hammock of oaks. The footpath is well-defined and easy to follow as you amble through this second-growth forest, and the trail is well-shaded. Crossing a short bridge, the trail turns left and heads deeper into the woods, where the a hint of floodplain forest starts to take shape on the right. Despite the size of the trees, there are clues this was once a farmer’s field. Although it’s no longer as obvious in the footpath, you can see the wavy shapes of the field’s furrows on either side, the forest growing atop the undulations. There are still mats in some of the dips, placed there long ago by trail maintainers to help stop erosion in the low spots. After the next small bridge, a long boardwalk begins. This is the first of many boardwalks you’ll traverse on this trail. Being in a floodplain, you’ll appreciate not having to get your feet wet too often. Even more appreciated is the slip control provided on the boardwalks – sheets of hardware cloth tacked down on the boards. With age and use, they’ve pulled loose in a few places, so still pay attention to where you put your feet. Thanks to the floodplain and its constant humidity, ferns and fungi are prolific. On this visit, I found colonies of collybia mushrooms spilling out of rotten stumps, and in the past, have photographed violet cort and coral fungus. This is the trail that encouraged me to buy the Audubon Field Guide to Mushrooms, since there are so many sizes and colors of fungi along this hike. 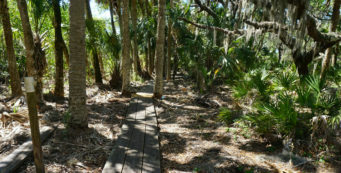 With palm hammocks and floodplain forest surrounding you, this section of the trail feels downright primordial – and you’ll have to hike it twice, since this is only the access trail to the loops. There are two loops along this hike, and two must-see short spur trails to scenic spots. After crossing a bridge over a tannic waterway that flows down to the St. Francis Dead River – hidden behind the screen of massive trees – you come to the first junction with the Yellow Loop at a sign at 1.2 miles. Skip it for now; you’ll peek down there on the return trip. Crossing another bridge over a stream, you walk beneath a grove of Southern magnolia and loblolly bay magnolia, both of which bloom in summer.Just up ahead is Confusion Corners – three trail junctions in quick succession. The first one, on the right, has a sign “St. Francis, 2 miles.” Turn right at the sign to start the St. Francis Loop. Walking counterclockwise around the loop gets you closer to the river more quickly, and that’s especially evident in your surroundings – more lush cabbage palm hammocks, where sunlight filters through the fronds to create an illuminating glow. More boardwalks get you over the damp areas. Rising uphill a little, the trail skims along the edge of the vast pine forests that sit just to the west. It continues to do this wobble back and forth, in the pines one moment – passing under an especially large loblolly pine – and back into the palms the next. Crossing a bridge over a murky stream, you’re back into the oak hammock again, a pine plantation sitting atop the hill. This was likely one of the last areas farmed in the forest before the Forest Service took the land over and planted pines. At 2.4 miles, the trail scrambles up a levee to reach a log bridge over a creek. Use the guy wires to help you keep your footing as you cross this bridge. Bowls of saw palmetto sweep off to the right as the trail clings to the high ground, dipping down once to go around a large fallen tree. You start to see cypresses in the floodplain, an indication that the river is near. If it’s rained recently, expect water to collect in the footpath through this section. Palm fronds dip right across the trail, making this section feel a bit like a jungle exploration. After a short while, the path straightens out and feels like you’re on a tramway above the floodplain. In fact, this swamp is criss-crossed with many tramways – used by loggers to remove the old-growth cypresses and pines – and the trail will follow quite a few of them on the rest of the route. At a T intersection with a sandy path with tannic water flowing across it, the blazes lead left, but you’ll want to turn right for a short detour. This spur tramway burrows deep beneath the canopy of palms to emerge, after a tenth of a mile, at the St. Francis Dead River. Fossil snail shells spill off the bank – this may have been a midden, or a midden was torn apart and used for fill for the tramway. You’re 3 miles into the hike. It’s a pretty overlook, and broad enough to be used for camping – as evidenced by some of the debris near the trail. Most of the year, backpackers are welcome to camp anywhere along the St. Francis Trail, and this is the first high, dry spot you’ll find. Camping is not permitted during general gun hunting season, typically Thanksgiving-New Years. Return back along the tramway to the trail junction and keep right. The trail turns right again quickly – don’t miss the turn, or you’ll end up in the pine forest – and continues along the floodplain. It’s here that most backpackers find decent campsites under the large live oaks. There is a permanent water source along this part of the trail, a continually-flowing artesian well that pours out of a pipe into an overflowing barrel. It’s off the trail a little, but you’ll smell the sulfur in the air before you hear the water. At 3.7 miles, you reach the St. Francis Road at a T intersection. This was once the Main Street for the town, with a post office, general store, and residences along both sides. It was a wagon road connecting St. Francis with Paisley. Take a short ramble down to the right to the end of the road, where if you can get near the shore – there are often people camped here, since they can drive in on this forest road – you can see the pilings from the old wharf along the St. Johns. Turn around and head up the road. It sits lower than the surrounding landscape so expect to find some large puddles to wade through as you walk straight up the shady avenue, the boundary for the Alexander Springs Wilderness to your right. Within a third of a mile, the trail veers off the road and left into the forest, working its way through cabbage palms and large live oaks. As elevation increases, you emerge into the pine forests. 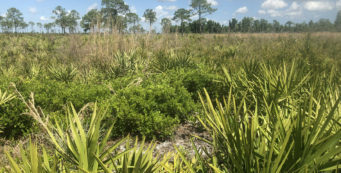 Slash pines and pond pines – obvious from the needles poking out of their trucks – create the sparse canopy, while saw palmetto fills the understory. Despite the dense thickets of saw palmetto, the footpath is smooth and strewn with pine duff. Thanks to the efforts of trail maintainers who dug out those palmetto roots, you can put on some speed through this section. Dipping in and out of shady spots, there are places you can see for some distance across the pine flatwoods. Crossing several jeep trails along the way, the trail works its way along a bayhead swamp where water may trickle into the footpath. You reach another logging tramway at 5.8 miles. The trail follows this for some distance, but it does – finally! – officially veer off the tramway in several places to avoid areas that collect deep standing water. The habitat is a mix of pine flatwoods and bayhead swamps, hence the constant supply of water. Working its way through the forest and crossing more jeep trails, the trail returns to Confusion Corners, where you enter a clearing under the oaks with a sign for the Yellow Loop off to your right. Turn right to amble back along this short side trail. A long boardwalk leads over a grassy area thick with ferns. After crossing two short bridges, you drop down a slope to cross a steeply eroded creek. The trail turns left to follow this small creek under a stand of southern magnolia. You cross several more bridges as the trail meanders through oak hammocks to its main point of interest—Rattlesnake Well. This sulfuric spring is a swirling hole of turquoise-blue with yellow streamers, both mesmerizing and smelly. Continue a short distance and you reach the main trail again at a T intersection. You’ve walked 6.7 miles. Turn right to head back down the entrance trail you came in on to the trailhead to wrap up a 7.9 mile hike. Hiked the trail this morning, and had soaked feet within about a mile of the trailhead. Conditions were so wet that I gave up even trying to avoid the deeper spots, and just plowed straight through them. Saw at least 10 deer, a flock of turkey, and 3 bear- one of which was the largest I’ve seen in Florida. Me and 6 of my friends set out on this 8 mile loop around 7:45am on Dec. 1, 2018. I was leading the group and a little nervous about hiking this trail after reading comments about trail confusion. So I printed out the entire trail description written above along with some of the comments and had 2 different maps of the trail just in case. It was much easier than expected as long as you pay attention! We did come across the fallen tree at around mile 2 but we saw the orange flag on a tree to our left and a white blaze just past the fallen tree (as stated in Ranae’s comment) so we walked around the tree on the right and quickly found the trail again. The only other issue we had was at about mile 3, after we stopped at the St. Francis Dead River overlook, on our way back to the trail, we went straight and ended up on a dirt road which turned out to be too far. We should have gone right before that. There is a white blaze there on a big tree but the blazes had been mostly on our right up until then. This one turned out to be on the left. It wasn’t much out of the way though so even if you do hit the road, just turn around. I saw this warning in the description but we still missed it. I should also mention that in the trail description it mentions a logging tramway at mile 5.8. I don’t know what that is but at this point, the trail came out onto a dirt road. We went left and after just a short distance the trail picks back up on the right. There is a white blaze and a wooden walkway but I can see where it might be easy to miss especially if you’re a bunch of ladies gabbing and not paying attention!! We saw no wildlife other than 2 hawks. We did see various poop piles, deer tracks and another kind of paw print. There were no mosquitoes (though we did spray beforehand), no ticks or chiggers. We came across one other person walking on one of the dirt roads. The trail was almost completely dry though we tested our balancing skills and walked on all the puncheons even though we didn’t need to. The walkways were well maintained and we could even smell the newness of the wood on one recently restored section. We all agreed it was a great hike and we look forward to the next one. The copious notes describing the trail were extremely helpful. Thanks to whomever took the time to be so thorough! Now go out and hike!! Just hiked this yesterday. 9/28/18. It was beautiful. They have painted white over all the blazes! Why I don’t know… made it much more difficult to see. Once white paint weather’s, it tends to blend in to the bark and fungi. At about 2 miles, before the levee climb, there is a tree down and I almost couldn’t find where trail continued. It’s a spot where water runs through when it’s wet so there are troughs that look deceivingly like trails. Orange tape around tree on left would make one think they need to turn here. But no of you look hard you will see a white blaze in front of you off to the right slightly. Hopefully they’ll get out and remove tree, or at least mark it better. Ran across 5 young men who were building new boardwalks in the section between the river and St Francis road. I did see a deer on the return trek and numerous tracks. And most importantly a large pygmy rattler on the beginning of the trail. No bear sign. I carry bear spray and honestly…I talk to myself, sing, occasionally holler out. I’ve been told it’s the human voice that keeps them away. Also I will be taking a bag to pick up trash next time. None on the trail, but the two water hangout spots were bad. Also the parking lot. But I picked that up. So if you’re going, take a bag. PLEASE. Oh and no ticks but I do where a pretty heavy deet spray. Thanks for the report. Glad to hear the boardwalks are being updated. Bummer about the trash. White blazing is because orange is now strictly reserved for the statewide Florida Trail. Great trail, but..! We went on it on July 8, 2018. Could not get to the river. 70% of the trail was covered with water. We constantly had to break through the woods! After 2 miles in, it was no way to keep going, so we had to return. Also like previous comments said, check on the ticks. I was fine with my trail pans, but my girlfriend was wearing shorts, and we found like 7 of them on her legs when we got home. 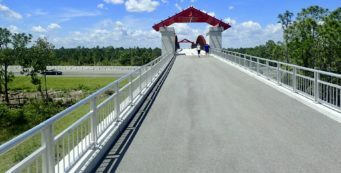 if you decide to visit this trail – definitely go during dry season. Definitely. We put a warning out on our Facebook page about the St. Johns River flooding. This is one of the first trails to vanish when the river is high. You’ll run into similar problems at the Pine Island Trail at Blue Springs, and Culpepper Bend on the Econ, and likely all of Seminole Ranch and Tosohatchee right now, too. Did this trail solo on 6/20/2017. This was on a Tuesday so I was completely alone on the trail. Saw some bear paw prints and became a little nervous, since I did not have a whistle. It was also following a coupe of weeks of daily rain, so parts of the trail felt like the tropics. It was damp with a few wet spots, however I was able to maneuver around them. About a mile in from the trail head, there was a downed tree blocking the path, with multiple branches. It was a challenge to get around. Additionally the log bridge over the creek was a bit of a challenge to cross due to the moss that caused the logs to be slippery. It was imperative to hold on to the guy wires. There was wire mesh on many of the boardwalks which was extremely helpful, as the wood does become slippery. There were numerous spiderwebs on the wooded trail to St Francis. It was a relief to arrive at the T intersection of the St Francis Road. The river view was magnificent. It was very easy to find the return loop due to the blade markings. The beginning of this loop was much different, as it was very open walking through the cabbage palms. I did catch the rear end of a frightened deer as it scurried off. This part of the trail had two planked boardwalks instead of the three as on the first loop. Also, there was no mesh and these boards were extremely slippery. Luckily, there was no standing water around, so I was able to avoid them. I loved the short yellow loop most of all. I feel this part had the most character of the entire trail. I really enjoyed this trail. The blade markings were easy to follow. The environment was very diverse. However, I doubt I would hike solo again during the week…and without a whistle. It’s certainly what we consider an adventuresome hike! Just hiked out here and my only complaint is the amount of ticks out there! Then again it is summer in the forest but I noticed a lot of this year so far. Great hike but I wish I could find some old artifacts from the town but it appears it’s gone! Just hiked here (4/11/15) and it was beautiful, but I agree with Joe Dunn…I picked about 20 tiny ones off me when I got back…and ticks are usually not very interested in me! lol Great trail, but I was a little disappointed that I saw absolutely no wildlife (except for ticks! and a few salamanders and dragonflies).